A friend had told her about the new dating site a few weeks ago. She had shared the news of the site as a tidbit of weirdness. Someone wanting a Mommy or Daddy was so fake. They must just want to con someone out of money. Her friend had no idea that Madeline was interested in age play. Penelope had gossiped about it at lunch saying that it must have been designed by a very wealthy man with deviant sexual tastes. Madeline had a completely different reaction to the news. She tried to act nonchalant but inside she was cheering with excitement. She sped home that afternoon and logged on immediately. Madeline had visited it frequently in the last couple of weeks trying to decide whether she should try it or if she should just give up and settle for another vanilla relationship that was doomed to failure. Finally, she had filled in the application. She had to take a picture of her ID proving that she was over eighteen and attach it to her application. She took a deep breath and pressed the join button before she could talk herself out of it again. Madeline stared at the screen as it announced that her application had been received and that she should receive a notification of any suggested matches as soon as her application was fully processed. Madeline takes a chance and finds the PLAYTIME app matches her with the perfect Mommy and Daddy. 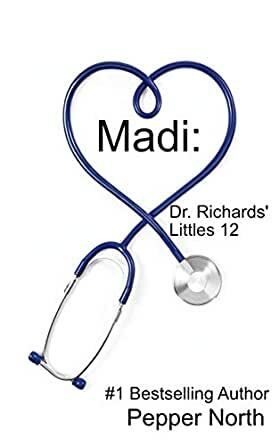 This twelfth book in the popular Dr. Richards' Littles book focuses on Madi and her new parents who are eager to thoroughly take care of their Little girl. Some of the characters from the first eleven novels in this series reappear to continue their stories. You do not need to read the stories in order. All are complete stories. The books in this series will feature invasive medical treatments, including thorough examinations and enemas when required, as well as diaper changes, spankings and other punishments. If you are offended by age play (adults who choose to live as a Little or a parent of a Little) or dubious consent, this is not the book for you. Another great Dr. Richards' Little story. Enjoyed the change of having a Mommy and Daddy. In addition to the main characters, I enjoy reading about the caring and giving of the community as a whole. As always, can't wait until the next one, they seem to end much too quickly! Love the new characters, great Story line as always, glad that Nora & Ryan found their little Madi. Glad Oliver told her his story so she wouldn't be afraid of him. Can't wait for the next book . Just love the Dr Richards Little books . The story flowed easily . Hopes and fears were expressed sensitively. The characters were real , the live fairly jumped off the pages. Well done.